7-night stay in well-rated aparthotel on Lanzarote + flights from Manchester for just £139! MAY: 7 nights at well-rated aparthotel on Lanzarote + flights from Manchester for just £168! Winter escape on Lanzarote! 4-night B&B stay + flights from Paris for €139! 7 nights on Lanzarote + non-stop flights from Rome for just €188! 7-night stay in well-rated aparthotel in Lanzarote + flights from Scotland for just £167! 7-night stay in well-rated aparthotel in Lanzarote + flights from Glasgow for just £188! 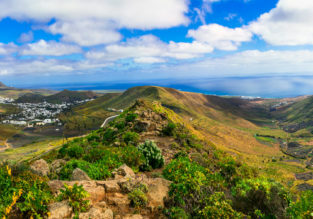 7-night stay in well-rated aparthotel on Lanzarote + flights from Edinburgh for just £147!